The reason I have Nathan as my guide dog, he is part of me and looks after me all the time, he is with me everywhere i go. He is a very special part of my life, he looks after me and i look after him. When I discovered I have Usher syndrome the news can be devastating for myself, and my family from few years ago in 2005. Many people do not realise how lucky they to not have the same thing i have. They take it for granted having driving licence and go out where ever they want to gp without barriers stopping them. They are very lucky to be normal. I can’t do that because I have to do things more hard and make an effort to catch the bus or train to go places I would like to go. My dream was to become a Pilot for the Flying doctor Service of Australia because I wanted to help people in good ways. I know I can’t do that and my only way I can, is to become a Computer Pilot as a serious hobby. I fly for 4,000 hours over six years on my PC on Flight simulator FSX with the Beechcraft King air like the Flying Doctor Service use it daily, that is the only plane i know how to fly well. When my parents and I were on holiday in the Blue Mmountains, we met a nice guy who owns a big Flight Simulator, he offered me a ride in his jet plane to fly around Sydney using the Flight Simulator. I had a wonderful time and will always remember that day because he helped me feel normal as other people can do. I was given a chance to feel something great for once in my life. My parents always made sure me and my sister Felicity experienced lots of things in life. I always use my legs and Nathan always helps me to get where i want to go and not by my sight. Usher syndrome is the name given to a range of genetic conditions which cause deafness or partial hearing from birth and sight loss over a number of years. Some individuals are born with a profound hearing loss; others are born with normal, near-normal or partial hearing. This level of hearing may remain stable or deteriorate over time. Sight loss often begins in late childhood and is caused by an eye condition called retinitis pigmentosa (RP). Early symptoms of RP include difficulty in seeing in the dark and in different lighting conditions. Over time, vision gradually deteriorates until tunnel vision develops – although the extent of this varies from person to person. My parents found out while I was born and I did not start to walk unit I was 5 years due Balance problem. The condition until I was born while i didn’t realise throughout my teenage years until I was around 25 years old and I started to begin to have problems with my sight and balance. I have grown up as deaf, and coming to terms with losing my sight as well can be very hard than you thought. I was born with these conditions and not know why I have it, but got it by gene. God gave it to me, it made me a better person because it has helped me to understand and stay positive as I can. I don’t blame anyone for that. As my vision was made smaller overtime, I felt very isolated from others. Deaf and hearing world have been my main friends and my family who know me well. I have had a hard time to make what I can do before I lose my sight. I will often experience communication problems as it becomes more difficult for me to see their sign language and their face in future when I am loosing my sight. I wrote these things because I want you to understand how I and my sister, Felicity live with it. I want to get it off my chest to tell everyone to make sure they understand clear. Other things you wonder why I am single. Lots of women reject me and leave me while running off because I tell the truth by having what I have. They do not know who I am without the chance of getting to know who I am, I did respect them and make them happy. I did A to Z on everything romantic. It is not working at all, I will not give up at all and will keep going as where fate takes me. Still going and doing things makes me happy for no reason. I will go and try new things and hope it goes well. I always make sure I am not isolated by going out, it keeps me going out more to meet new people. I always help my family all the time and even my closest friends around me. I do anything to keep them happy and support by no matter what. I will do anything for stranger as well. That is the reason I love my parents and my family so much. Last week I did stand up for my dad when people abused my dad for no reason, I told them off and protected my Dad because my Dad will do anything for me all my life. Family comes first than anything in my life. I always have time for them and help them out because I believe it is my duty to born on this earth and has reason to do it. That is how my heart tells me to do great for long time since I was born. Other things in the future, I know I will give up a few things that I love to do everyday like sailing on my wood boat and doing outdoors stuff. I would rather have lots of family members come and talk to me anytime and my closest friends will stay contacted with me when they can.. which is more important than anything. I know many of you who read this will be very shocked and upset when you find out what we have been diagnosed with – Usher syndrome. It made me and my sister Felicity felt comfortable knowing you and others will make a bit of an effort to come and tell us you care and can help out as you can, which will help us to stop becoming extremely depressed about the future. We didn’t want to ask for pity or other things. We just want to make sure our family and friends understand more on what we have that will make us feel better and know all of you will care about us when we need support without judging us. If you read and understand our condition, it can help me or Felicity break down the sense of isolation and provide support to us. Please talk to us if you want to know what we can do and can’t do, we always tell the truth and explain everything to make you understand fully 100%. Please do not cry or get upset, we are fine but want you to understand what and how we have felt for a while. We just want you to come and say hello to show you care! Please comment if you want to say something good… and not be scared to do. 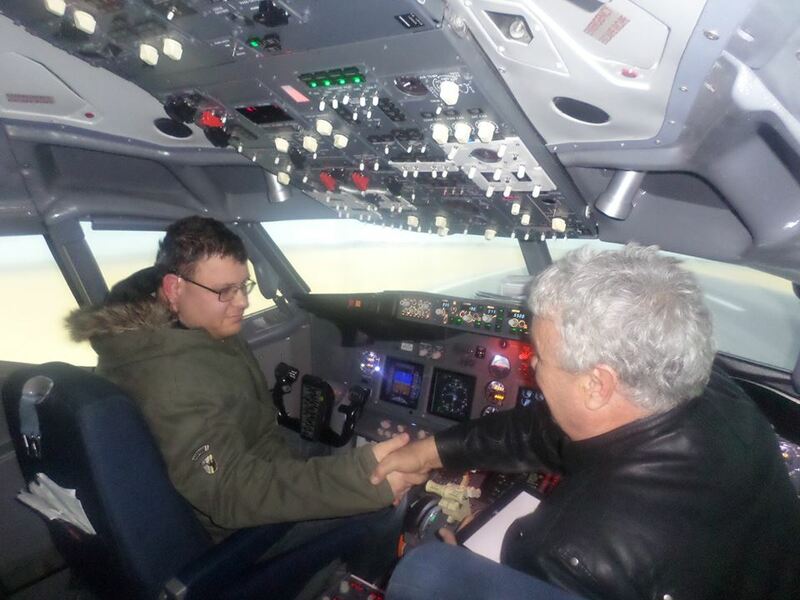 Photograph of myself and Captain Pilot in Flight Simulator which was the best day of my life— feeling confident.